Alessandro Rossi was the founder of Rivarossi. It all started with a passion for trains. When he was a small child, growing up in Italy, he was given a Meccano (Hornby) tin plated clockwork toy train, and his mother built a railway station for him with old matchboxes. From that time forward every year for Christmas Alessandro asked for more toy trains. His father bought him a subscription to the Meccano magazine in English and in French when he was growing up. This is where Alessandro learned technical terms related to trains. In October of 1945, thanks to a small inheritance left by an uncle who was a priest, Rossi bought a part of the ASA factory that made electric commutators. Antonio Riva was already an associate there. Rossi immediately changed the name of the company to Rivarossi Limited, but Riva quickly left the company, when he realized the new plans, and change of product that Rossi had in mind - electric model toy trains. In Italy at that time, there were no producers of model trains. Lima and Conti started shortly there after. The only makers of reference were Märklin and Trix. In 1947 the company moved from Albese Cassano to a new location in Sagnino. Rivarossi's main manufacturing plant was located in Como, Italy. Initial train production was in 'OO' gauge, used three rail track, alternating current, and was targeted at children. However, the first trains ran at speeds in ratio to scale prototypes, thus were more realistic than the 'OO' gauge products made by the competition. Later production was for two rail track and used DC current. Production for American markets was in HO gauge and began around 1950. The American Streamliner Milwaukee Road Hiawatha 4-4-2 Locomotive and tender was one of the first locomotives produced by Rivarossi, and production ran from 1948 to 1954. It featured front lighting and a worm drive that used ball bearings in an oil bath. The ones that have survived corrosion and metal fatigue, have now reached high prices amongst collectors. The Rivarossi model showed a notable resemblance to the actual Locomotive prototype, both in the silver, orange, brown and black paint scheme, and in it’s construction. The Rivarossi HO gauge Hiawatha was also offered in other color schemes and as an unassembled kit. In 1952 a baggage car/postal van and passenger coaches painted to match were also created using the HO models of Italian State Railway FS type cars. These remained cataloged until 1960, when more prototypical ribbed-sided cars produced by Athearn were substituted in sets. Distribution of Rivarossi products in the United States from 1948 to the end of the 1950's was handled exclusively by the Polk Brothers - Nathan and Irwin, the founders of Aristo-Craft in New York City. In 1950 an initial foray into 'O' gauge production was attempted, but the simple pressed sheet metal model of an Italian State Railway 685 FS 2-6-2 steam outline loco with 8-wheel tender that was intended to be an economic line toy train targeted at first time buyers did not sell very well. 1950 also saw Rivarossi introduce their 'Minobus' trolleybus system. The bus was modelled after the Alfa-Romeo T110AF bus that was commonly seen running on the streets of Como and was in 1:80 scale. Both the bus and the track were Rivarossi's own development, and not compatible with other systems. The body of the model was made of bakelite and had operating headlights and interior lighting. The system operated on both AC and DC current at 4-16 volts. The system was manufactured through 1957 and was available in both a kit and ready-made model. The early model trains made by Rivarossi used sheet metal, milled, turned and die-cast components. But a gradual change to plastic as a the primary material took place. Alessandro Rossi realized that the use of plastic (bakelite) would allow much more detailing than was possible with metal, sheeting, or in metal fusion, and Rivarossi became the first train manufacturer to use it in this sector. The Fairbanks-Morse C-Liner streamlined diesel locomotives were the first American style diesel models built by Rivarossi. This locomotive was a milestone in the history of Rivarossi production because it was one of the first produced using the plastic injection mold process and also because its production lasted for many years. It remained catalogued and produced in HO gauge by Rivarossi from 1952 through 1971. The C-liner was available as an A unit only or as an AB configuration. Only A units had motors. A version with an operating horn was also available. It was decorated with a wide variety of liveries including the Southern Pacific, Union Pacific, New Haven, Pennsylvania, Santa Fe, Western Pacific, Illinois Central, Chicago & North Western, Monon Route, Texas Pacific, Pere Marquette, Minneapolis & St. Louis, and Wabash rail roads. In 1956 Rivarossi was commissioned by Italian automaker Fiat to produce models of their 600 and 500 automobiles that would be issued shortly after the introduction of the real cars. This is when Rivarossi began a relationship with Italian modeler and metal engraver Arnaldo Pocher to produce the models. Pocher was up until that time a producer of accessories for plastic model railways, freight and passenger carriages in white metal and locomotives and motor carriages. Over the next several years, Alessandro Rossi would infuse capital into Porcher's operations and help transform the business into an S.p.A. Starting in 1957 Rivarossi manufactured the HO trains that were licensed, packaged and sold by Lionel as Lionel HO. This relationship only lasted for one year. By 1958, Lionel switched to Athearn for production of their HO gauge products. The 1960's were considered to be the golden era for Rivarossi with some history-making models being created. This included the Big-Boy model of the largest steam locomotive ever built, which ran on American railroads. 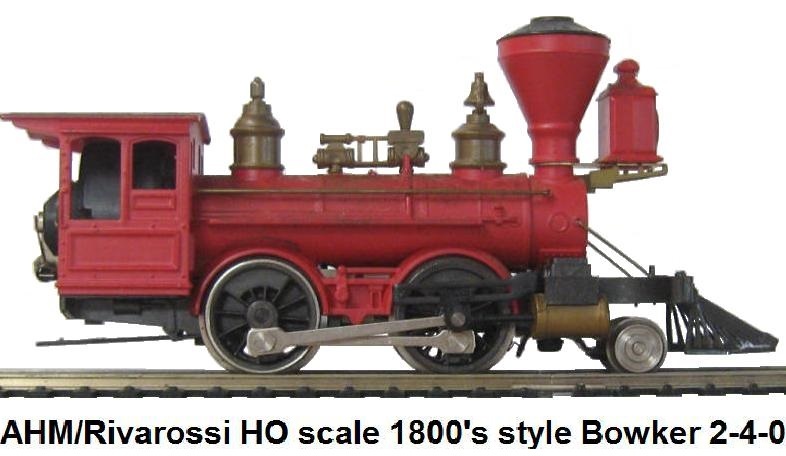 Rivarossi was the first company to produce a model of this famous locomotive on an industrial scale which resulted in great sales in the U.S. market. All US distribution of Rivarossi products were now being handled by Bernie Paul in Philadelphia, intially via his General Hobbies Corporation (GHC), but later the company name was changed to Associated Hobby Manufacturing (AHM), and Rivarossi products were packaged in boxes that had AHM labelling. The US market was always considered to be important for Rivarossi. During the 1950's the only American carriages offered were the adaptations of Italian coach models, mainly made to supply sets to accompany the Hiawatha locomotive. In 1960 the first passenger cars modeled after American prototypes appeared in the Rivarossi catalog. As mentioned earlier, these were produced by American manufacturer by Athearn and remained in the catalog until 1963. Rivarossi began to produce its own HO scale American style Heavy Weight 1920's era passenger coaches in 1964. These featured 3-axle trucks, and several had furnished interiors. Cars issued included Pullmans, Combines and an Observation. In 1966 Diners and Coaches were added. In 1985, 2 other models, a Duplex Sleeping car and a Post Office/Baggage car were issued. And in 1987 an express Baggage car was added. In 1966 Rivarossi introduced its 1930's streamlined style passenger cars. These were initially referred to as modern or Smooth Side coaches. Together with the Heavy Weight cars, these streamlined coaches remained in the Rivarossi line for several decades, decorated in a multitude of American RR liveries. These cars were sold in the USA through importer AHM. In 1987 ribbed-sided streamlined passenger cars were added to the line. These were initially supplied with the Hudson loco, which made up the Rivarosi/AHM Empire State Express set. Rivarossi's relationship with Pocher resulted in the addition of their Old Time coach line in 1962, which also remained there for decades. In 1965 Pocher of Turin, now the maker of high-end die cast 1:8 scale collectable car kits and HO scale trains, was fully aquired by Rivarossi. In 1967 Rivarossi manufactured and supplied N scale trains (early steam and diesel locomotives, freight and passenger cars) for Atlas Tool Co.
Rivarossi came out with an 'O' scale line of trains again in 1968. Included in the catalog were BR80 and V216 German locomotives, Fairbanks Morse styled AA diesels for the American market painted in several famous liveries, a Pioneer Style 4-4-0 steam outline loco in 2 different liveries, and a small diesel 0-4-0 Dockside Switcher shunting loco. These were all offered in various sets complete with track, transformer and either freight or passenger wagon consists. These trains were true to scale and detail of the prototypes and could operate on 2-rail track. From 1969 to 1979 Rivarossi produced a highly accurate HO scale model of the famous American Electric locomotive the GG-1. It featured fully functioning front headlamps, and working pantographs. Although it was 30 centimeters long it could navigate 64cm track radius easily because of a unique system of joints in the power train and trucks. Rivarossi's GG-1 was made in 11 different paint scheme liveries. These were the Pennsylvania RR (red, green and silver), American Railroads, Amtrak (red/silver, black), Penn Central, Spirit of '76, Conrail commemorative, Pennsylvania "Black Jack", and "US Saving Bonds". By 1970 Rivarossi had a workforce of 300 and that year saw the release of an 'O' scale E.444 FS series loco for the European market. An 'O' gauge model of a French 4-6-2 Paris-Lyon-Mediterrannee (PLM) steam locomotive 231G 230 was made by Rivarossi for Fulgurex in the 1970's. It came in the traditional chocolate brown Nord Chapelon livery. For the American market an 0-8-0 Indiana Harbor Belt 'O' gauge steam loco with tender and a 4-6-0 Illinois Central Railroad (ICRR) Casey Jones steam loco also in 2 rail 'O' gauge were made. AHM packaged and offered these loco's in the US in kit form both with and without motors. In the 1970's Rivarossi sales in the United States through AHM accounted for 80% of total volume. However, the 1970's also saw the beginning of the decline of model electric trains as a desired toy by children world-wide. 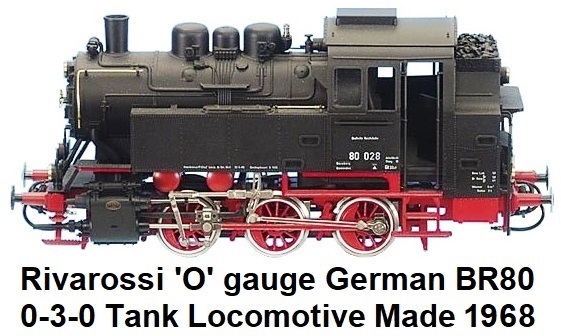 By the 1980's the popularity of 'O' gauge trains was greatly diminished and Rivarossi was cutting back on the manufacture of products in this scale. One new Rivarossi offering was a suberp model of a French Pacific 231g #696 in green livery made by Capolavori. A German BR80 030 steamer in 'O' gauge painted in gray, black and red was released in 1982. Only a limited edition of 800 stamped and numbered units of these two locos were manufactured. These 2 locomotives were offered in both kit as well as fully assembled versions. Interestingly, Rivarossi offered the kits with and without motors. Kits that came without motors had plastic wheels. Coaches avaliable during this period were available with or without interior furnishings and lighting. The interiors and lighting modules were offered for separate sale as add-ons. The interior lighting was powered by a battery hidden in the vestibule. Freight wagons for the American Market were made from AHM molds and train sets offered in the American markets were always jointly labled as AHM/Rivarossi products. Due to the continued declining sales and administrative problems in 1984 Alessandro Rossi left the company he founded. Rossi and his wife Teresa withdrew into private life in Cortina d'Ampezzo. In 1985 the US importer of Rivarossi products, AHM, went bankrupt, owing Rivarossi about the same amount as the capital value of the firm. By 1990 the 'O' scale product line was mostly discontinued. The only products made thereafter were special limited edition models in the Rivarossi Masterpiece series. This included the American 4-4-0 Genoa steam loco in 1992 that had the image of Christopher Columbus on the tender sides. In 1990 there was an infusion of new capital into the company via a sale of shares to Pentech of Milan. In the mid 1990's the U.S. importer of Rivarossi products was Model Expo. In 1997 a limited edition American Orient Express in HO gauge was marketed. Around 1998, Lima in Vicenza and Arnold in Germany were in bankruptcy and the tooling was sold to Rivarossi. The Italian government landed the sorry mess on Rivarossi - they gained the tooling and dies etc. but at the cost of keeping the Italian factories open. In 2000, management closed the factories in Germany, France and also the historic location of Como, bringing all production to the Lima production plant in Isola Vicentina. Lima S.p.A. was established shortly thereafter as a receivership on December 27th 2001 from the merging of all 5 previous companies belonging to the Rivarossi Group (Rivarossi, Arnold, Lima, Jouef and Pocher). On March 27, 2002 the company head offices were moved to a new building in Via della Musia, 58 - 25135 Brescia. In 2002, Rivarossi released a Chesapeake & Ohio Allegheny 2-6-6-6 HO gauge locomotive. Rivarossi always had a tendency to concentrate on 'big steam' such as the more well known American steam locomotives like the the UP Big Boy and Challenger, the SP Cab Forward, and the NYC Hudson, so this was one more example. The list price was in the range of $300 - $400. The Allegheny came without traction tires, which were commonly found on all other locomotives from Rivarossi. However, they could be purchased as an option. Again in 2002 the US importer of Rivarossi products folded leaving debts greater than the capital value of Rivarossi. Operations were ceased completely in 2003. On December 16, 2004, Hornby announced the acquisition of the well known European model train manufacturer Lima S.p.A., along with certain assets of the Rivarossi, Jouef, Arnold and Pocher ranges. Hornby moved Rivarossi train production to China. Walthers became the primary US importer of Rivarossi products. Alessandro Rossi, the founder of Rivarossi passed away on October 16, 2010 at the age of 89. It is ironic that the company he founded 60 years earlier wound up in the hands of Hornby, which was the maker of the first toy trains that Alessandro Rossi played with in his youth, and that inspired him to create his model railway. This famous Italian brand, synonymous in the world of the finest quality railway modelling, is again in the market with products for Italian, German and American consumers. Many of the Rivarossi range of Italian outline locomotives made under the Hornby family now featured NEM couplings and sprung buffers, as well as were pre-fitted with a socket for a DCC decoder. In 2013 a Henschell-Wegmann Zug train was made available in cream, violet and silver. There were also several black versions of the streamlined 4-6-6T locomotive. Another first time item was a US Transportation Corps stripped down 0-6-0T switcher modeled after a prototype used in many countries after World War II. Also available were a number of variations of the DB E10 and the DR E251. A new 2-4-4-0 BLS class Ce 4/6 electric with jack shafts and side rods came in a wooden box for the BLS centennial. Also available was a large variety of new Italian electric locomotives and a new 'Pendolino' railcar set. Other interesting items included a DR class 58 decapod and an Austrian class 1073 electric. One version of the 1073 was available inscribed 'U.S. Zone Österreich'. By 2015 Rivarossi was producing other new items including a variety of Italian steam locomotives in 940, 740, and 741 classes. There was also a variety of new 'Pendolino' sets, none of which tilt in HO, like the real prototypes do. There were DB and ÖBB ICE trains, as well as a variety of new models of East German equipment, including 'Touristenexpress' cars that traveled from Dresden through Budapest and Bucharest to Varna, plus some new DR 'Mitropa' sleeping and dining cars. And there was a brand new model of an Austrian class Rh 1046 electric locomotive with a built-in luggage compartment. 2016 saw the release of a number of completely new HO gauge Rivarossi locomotives. The Italian class Gr.744 2-8-0 was delivered, with a glowing firebox. There was also a new DRG class 930-4 2-8-2T locomotive in a variety of versions, and a class 58 decapod in German, Austrian and French versions. There were also a wide variety of passenger cars, with lots of East German (DR) equipment, including double-deck commuter coaches and a number of different 'Mitropa' cars. Among these were an interesting set of light blue DR 'Tourex' cars that also traveled from Dresden through Budapest and Bukarest to Varna on the Black Sea from 1963 until the reunification of Germany. In 2017 new or modified Rivarossi items included an Italian class GR40 2-8-2T and class 851T 0-6-0. There also were a number of new versions of a tiny industrial locomotive used in factories to move single cars around (the locomotives used the weight of the cars they were shunting to improve traction). There also was an Italian class E428 4-4-4-4 electric, which was a new version of a classic Rivarossi design of years gone by. Rivarossi also released a variety of new passenger cars, primarily of Italian design. These included a group of East German cars for vacation travel, as well as a five-car version of the pre-war Henschel-Wegmann train with its characteristic 4-6-4T streamlined locomotive in purple and cream. Link to Rivarossi products on the Hornby web site. Link to Rivarossi Memories web site English Version.